The most striking thing about The Crew is its miniature recreation of the United States . Also, it's called The Crew, which would suggest that crews will be involved in some capacity—likely rolling around the aforementioned recreation. A new trailer confirms that they are, and shows some of the ways that your crew can operate. It also shows that Ubisoft missed a trick by not calling their trailers "Crew Cuts". Come on Ubi, this is basic stuff. Multiplayer is designed to be a seamless process—letting you drive up to your friends and slot into the action without waiting around in lobbies. There are co-operative events to tackle, and inter-crew scores to beat. Or, should you stumble upon another crew, you can drive up and start bothering them immediately. Maybe the racer will be what finally persuades me to add some friends through my socially neglected Uplay client. 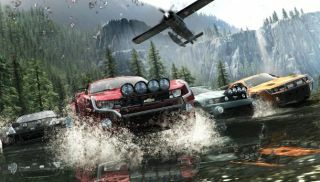 The Crew is released on 11 November.